This coming Monday, July 30, I’ll be making the trek back up to what seems like my home away from home, UCLA Medical Center. At 8 am I am scheduled to have a PICC line placed at Ronald Reagan hospital; following the PICC line procedure, I’ll head over to the UCLA Outpatient Surgery Center in the building next door to have my tissue expander placed. It was a bit of a hassle to get approval for the PICC line, but I’m so glad we were pushy (shout out to my mom for making it happen!) For those of you who don’t remember, I have BAD veins. They run and hide when I get within five miles of a medical facility. When I know I am going to have my blood drawn, I prepare the day before by drinking a lot of water to pump up my veins. When I was admitted to the hospital for a cellulitis infection in late April, my veins were not prepared for needles and I was already dehydrated from being sick. When the nurses tried to draw blood, it took them three pokes (with multiple people involved) until they had success; when they tried to start IV antibiotics, it was even worse. I ended up being poked for blood and IVs about ten times during that hospital stay because my veins would either not produce any blood or they were too fragile for the strong antibiotics. By the third day at the hospital, none of my veins were strong enough for a simple IV, so I was switched to the PICC line. The PICC line was my savior. I never thought I would love something attached to a needle as much as I loved that PICC line. “PICC” stands for peripherally inserted central catheter. It is a small needle attached to a port that is inserted into a deep vein (in my case, in my upper right arm). It’s then fished through to another vein close to the heart. A PICC line can stay in place for weeks without being changed, and it can be used to draw blood and to administer fluids such as antibiotics. For those of you who know my family, when my dad was at UCSF in 2010/2011 with a foot infection, he received routine antibiotic infusions through a PICC line. An illustration of how a PICC line works, from Macmillan Cancer Support’s website http://www.macmillan.org.uk. Once my PICC line was inserted in April, the rest of my hospital stay was a breeze. I didn’t feel any burning from the antibiotics and no one had to poke me in the middle of the night for blood tests. This time around, my mom and I have been adamant that I receive a PICC line from the start. I know Dr. Festekjian is going to put me on IV antibiotics as a precaution, and I know I am going to be put under anesthesia. Both of those things mean needles. Any needle poke runs the risk of infection; with my non-compliant veins and history of infection, why would I want to take any chances? PICC line, here I come! In terms of the actual tissue expander replacement surgery, I anticipate that it will be pretty easy. It’s performed in UCLA’s outpatient building, which already makes it seem more minor. There’s a good chance I will stay in the hospital overnight just to be safe, which is fine with me. And I only plan on taking one week off from work, as opposed to the three I took after my mastectomy surgery in March. To be honest, the biggest concern I have is what I’ll look like with my newly-inserted tissue expander. I’ve really adjusted to having my cotton prosthesis and Waterproof Falsie; they are the perfect size to match the 550 cc tissue expander on the right side! But when Dr. Festekjian puts the new tissue expander in the left side, he will probably only fill it up to about 200 ccs; tiny in comparison to the other one! Does anyone have any suggestions for what I can do to not look lopsided? There will probably be at least one month of unevenness; I don’t expect to start my saline fills until two weeks after this surgery. And even when the fills do start, it will take a few sessions before my left tissue expander is equal to my right expander. 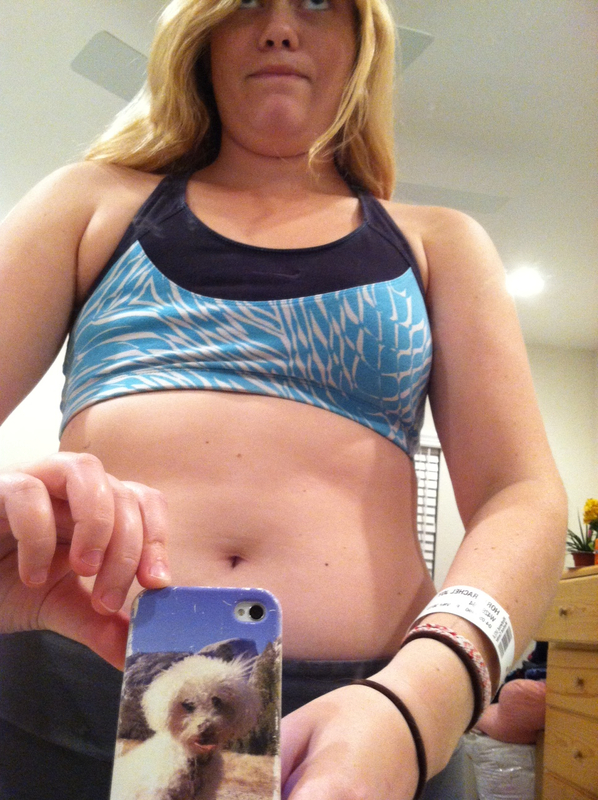 Okay, nothing could be more lopsided than this: tissue expander on the right side, nothing but chest wall on the left! I’d love to hear what people think. My initial thought is to use socks or something to fill empty bra space. Anyone else have a better idea?! This entry was posted in Plastic surgery/breast reconstruction, Tissue expanders and tagged antibiotics, Dr. Festekjian, PICC line, prophylactic mastectomy, prosthesis, surgery, Tissue expanders, UCLA Medical Center by Rachel Joy Horn. Bookmark the permalink. Rachel, see the TE Trouble thread on BCO. The ladies were just talking about this very issue! I also just discussed it in my July 15th blog post. I’m glad you are getting your expander put back in so soon. (I had to wait 5 months, so 3 months seems fast to me!) Good luck on Monday! Rachel, congrats on the new TE! I can’t wait to get mine but have to wait till chemo is over – so another 4-5 months. I bought a silicone insert that has a pocket in the back for filling with fluffy material, so you can make it as little or as big as you want. It works really well and my insurance covered it. Hi Rachel – Glad you’re doing so well. Good luck with the next phase! How about trying a little poly-fill (you know, the white fluffy stuff used to fill pillows and quilts) in the interim? It could work. Love you, Cindy. Not so full of good ideas… just good wishes. You seem to have a creative Mom. I am sure once you are all set she will help even you out. All the best! So proud of you, Rachel. Wear your “war scars” proudly and don’t try to hide anything. Your imperfections are beautiful and human too. Hope to see you for our yearly lunch after the fall rush. Good luck on Monday! Compared to what you’ve already been thru, it will be a breeze! For after surgery you might want to try braletts with removable pads and remove the right pad. I’ve only recently started my fills again since my infection so I’m only up to 360 cc’s but I have found them pretty comfortable and the pads make me look pretty normal. I had trouble finding them initially and ended up buying them online at Bare Necessities and JC Penney – now they seem to be everywhere. I also got some really cute camisole type ones at Marshall’s. I’m thinking they might be good to wear after after The Exchange too. Happy, healthy healing thoughts to you! Wow. Your attitude with this really is incredible. I envision I’d have such a rough go. I’m so glad I found your blog!